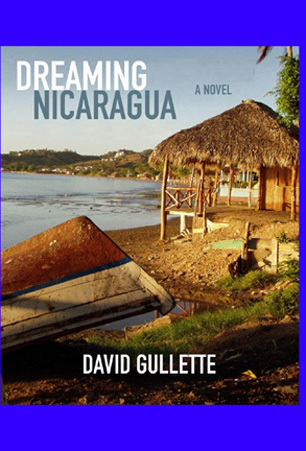 To learn about (and order a copy of) David Gullette’s novel DREAMING NICARAGUA, which is set in San Juan del Sur, go to Fenway Press. All proceeds from the sale of this book benefit the work of the Newton/San Juan del Sur Sister City Project. DREAMING NICARAGUA: Jesse Pelletier is a Vietnam vet who runs a cheap hotel named Ospedjae Gringo Pinolero in San Juan del Sur, a beach town in southern Nicaragua. The year is 2000. Jesse’s previously-estranged daughter, Suzy, is visiting him for the first time; she falls for a local ecological activist, Camilo Sanchez, who promptly disappears. Or maybe he has been disappeared. Counterpointed with this realistic millennial material is an earlier, imagined San Juan del Sur, in the 1850s, where another Jesse Pelletier, veteran of the Mexican War, has married a local girl and runs a hotel catering to the Gold Rush-bound passengers of Cornelius Vanderbilt’s New York-San Francisco steamship line. The parallel timeframes and intrigues and characters (including Mark Twain and the “Filibuster” chief, William Walker) echo off against each other as the tension rises. Fenway Press, 68 Pembroke St. Newton, MA 02458.